In some cases, you might want to have only one Tomcat installation but use separate ports to deploy your application. As example case if you want to have the same context name to run on the same server. My solution on this matter, I introduce the port separation on the tomcat server.xml as shown as following. 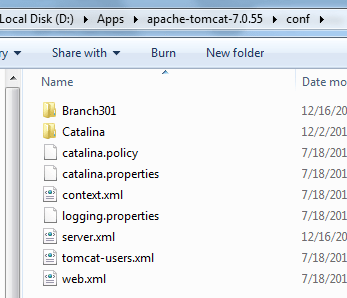 After restart your tomcat, it will create separate context folder for you so that you can place different application deployment for each connection port on single tomcat installation. As shown above, we can place different application context file in different folder (refer to each connection port) we wish. If you don’t know how to create tomcat context file, you can read here. Here, you can download the sample server.xml above.